Just so you will know, I am on a quest for the perfect cole slaw. 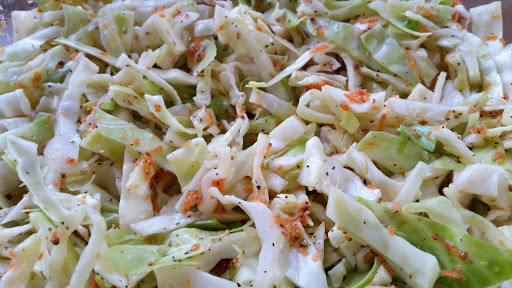 I’ve already posted a recipe for Oriental Cole Slaw and one for a 3 Week Slaw. Both of those are delicious but today I thought I would try something with vinegar and mustard. In a medium bowl, combine the cabbage, onions, and carrots. Refrigerate for a couple of hours to allow the flavors to blend together. I made this for our daughter’s Gender Reveal Party tomorrow!!! I can hardly WAIT!